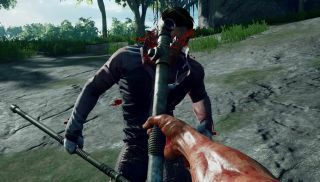 The Culling, announced last week, is a little bit Rust and a little bit Running Man: 16 players crammed into a tropical island paradise with nothing but crafting resources and 20 minutes to kill each other dead. It's being developed by Xaviant, the studio behind Lichdom: Battlemage, and it sounds like good, murderous fun, even though it's still very early in the development process. Which brings me to the point. A closed alpha is coming, and you may now sign up to take part. The difference between a closed alpha and a closed beta is a bit hazy but I think has to do primarily with lower expectations, which is to say that a beta will run reasonably well in most cases, while an alpha is more or less a success as long as it doesn't set your PC on fire. The Culling will go live on Early Access on March 8 and sell for $15/£15, which doesn't really seem fair, with a ten percent discount offered from March 8-14.